Flexible graphite yarn reinforced with graphite filament (No PTFE) c/w passive corrosion inhibitor. Offset square design makes installation easy; ensures tight seal in worn or oversize stuffing boxes. 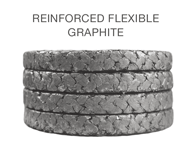 Construction allows the Flexible Graphite to fill voids in the radial cross section. Maximizes reliability and stability in high temperatures; also provides excellent chemical resistance. Dissipates heat quickly, so equipment runs cooler and requires less flush water & less energy. Graphite filament reinforcement resists extrusion in high pressure applications. Spool stock convenience reduces inventory downtime.